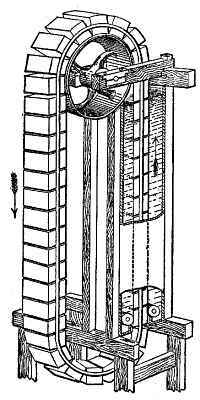 An upright tank, through which passes a number of floats connected by a band of elastic rubber attached to their ends, leaving just enough space between them to secure action on each side by the water. They are each of the same weight as an equal bulk of water at the surface, therefore the upper one in the tank has no comparative weight. The next lower one has a unit of upward force equal to the condensation of its bulk of water, and so on, each adding a unit to the upward tendency, until we come to the last, the pressure on which is altogether downward to the amount of the entire column of water; but we already have a number of opposing upward forces, and when we look on the other side and see the thirteen active weights, it seems clear that there will be a large surplus weight, over and above the opposing weight and the friction of the rollers and upper wheel. The weights were to pass through an elastic cylinder at the bottom.